Friday 13th January 2017 saw 50 players turn out to participate in this season’s 3rd Ranking Tournament, named after the late Carmelo Ellul, the GDA’s first President in 1958. 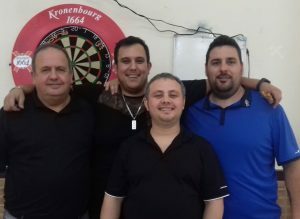 Once again it was evident that the standard of darts in Gibraltar is on the increase and that achieving the goal of a top 8 position will not be easy. The top 8 players have the opportunity to represent Gibraltar on the International stage, e.g. World / Europe Cups, Mediterranean Cup etc. This was a seeded competition based upon last year’s ranking positions. Two of the seeded players, Dyson Parody (Nº1) & Justin Broton (Nº4) progressed to set up a semi-final clash. Seed Nº 2Manuel Vilerio lost in the 2nd round proper to Antony Lopez who had begun the evening in fine form by beating veteran Dylan Duo in the preliminary round. Seed Nº 3 George Federico reached his Board Final losing in a close 4-3 match to Angel Debono, who has found great form of late. The Semi-Finals were both played at a high standard with great darts from all four players. Justin Broton was able to get the better of Dyson Parody 5-2 thus securing his place in the final. David Francis was able to hold off Angel Debono 5-2 to set up an exciting final. David won the bull to start the match, and after strong scoring from both was able to check out Double 16, leaving Justin with 40. He then dominated the next 4 legs, only one of which saw Justin on a possible finish, and the last of which saw David finish a 13 dart leg following back to back 140’s followed by a 100. Justin then bounced back after David missed the Bull after hitting 3 consecutive 140’s. Justin kept his nerve and took out Double 8 to claim his first leg of the final. He then took the next 2 legs, all of them with David not far behind making the score 5-3. However David scored strongly and after a few missed doubles checked out Double 2 for Victory and his first ever Ranking Tournament. There is no doubt it will not be his last. A total of 12 x 180’s were thrown with Adam Orfila acheiving the only 100+ checkout with a 116. 180’s – David Francis, Angel Debono x 2, Jarvis Bautista, Dylan Duo, Craig Galliano, Clayton Otton, George Federico, Jeremy Cruz, Antony Lopez, Tony Dawkins x 1. David Francis defeated Adam Orfila, Jeremy Cruz, Antony Lopez, Angel Debono. Justin Broton defeated Keith Medhurst, Ethan Smith, George Ramos, Dyson Parody. Commiserations to Justin Broton, Congratulations to David Francis!